Writer/Director, Anna Littler (back centre) enjoyed meeting guests afterwards and answered questions about making the film. Thank you so much to Gill and the Welcare volunteers who organised a screening of Blitz & Bananas in November to tie in with the Remembrance weekend. Despite rainy weather, they had a fantastic turnout and raised a magnificent £1,235. A lot of hard work went into organising the event by the Welcare volunteers and wonderful refreshments were laid on. 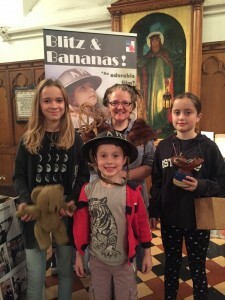 We are delighted that Blitz & Bananas screenings can help to raise significant amounts for very important charity projects, and the Royal British Legion’s Poppy Appeal also continues to benefit from screenings and sales of the DVD. Contact anna@blitzandbananas.com for more details.